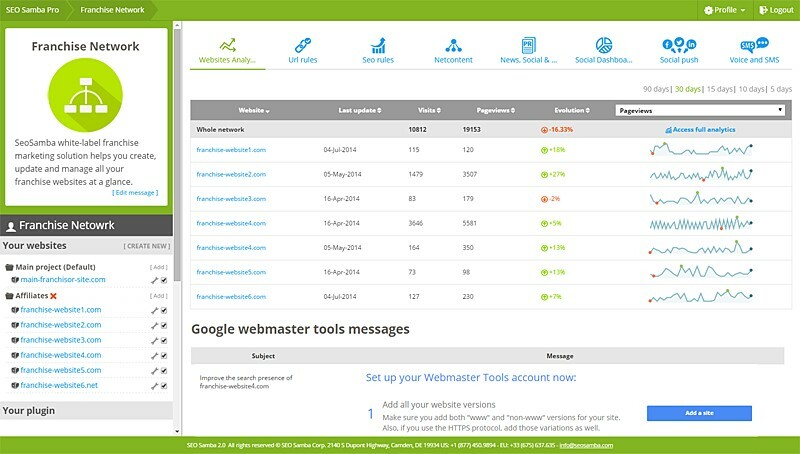 Free WordPress Plugin SeoSamba for Webmasters is a free must-have SEO and marketing automation plugin for any WordPress webmaster. WordPress Enterprise Optimize any size WordPress website in a day or less SeoSamba' technology optimizes millions of web pages, including corporate, directory and ecommerce websites in 14 different languages. Wordpress MultiSite Review How does Wordpress Multisite compare to SeoSamba for franchise networks and multi-site marketing. Click here for the answer. Very popular amongst bloggers, Wordpress has become the most-used CMS in the world in a few years span. The reasons for this success lay in the ease-of-use for one-pagers and simple websites, as well as the ever increasing importance of content marketing which has spurred the creation of millions of blogs and news-based sites. Over the years, Wordpress has evolved from a simple blog software to a website design software - including online stores - thanks to numerous extensions created by independant developers. Due to a growing demand, Wordpress has more recently developed a multi-sites version dubbed Wordpress MU, that was later replaced by Wordpress Multisites aka WPMS with the release of Wordpress version 3. While Wordpress' efforts to up its game for online marketers, the WPMS solution is still highly dependant on support from web hosting companies, thrid-party software and developers, which put website operators in a somewhat uncomfortable position. Indeed, while WPMS is free to use, putting it to work will requires much additional investment to customize and supplement its basic offering, with the looming threat of service discontinuation either from plugin providers or hired developers. True, Wordpress Multisite has a lot going for itself, but one needs to look beyond the "free and open source" smoke mirror to realize that things are not as easy, and certainly not as cost-effective as they seem. Back in 2008 when SeoSamba developed its exclusive 'hub and spoke' online marketing model, Wordpress was still in its early years and essentially an open source blog platform. Hence the need for a true multi-sites SEO platform bent on execution that could fit the needs of all website operators from single users to larger franchise networks and multi-location operations. While Wordpress has grown exponentially since then, introducing its Multisite platform along the way, SeoSamba has focused its resources in developing its own software, including the SambaSaaS online marketing platform, SeoToaster CMS and SeoToaster Ecommerce. The combination of these powerful tools gives website operators that are serious about online marketing much more power right of the bat, without the need to constantly need developers on-hand and third-party software with all its implications. In this report we take a good look at both solutions, and concatenate the analysis of reputable users marketers and technologists, which opinions you will find across the web with a simple search. While we do not pretend to compare WordPress Multisite and SeoSamba in every use possible, each one having its own merits and literally hundreds of features and extensions, we are confident that the latter is a much better overall solution in a multi-sites franchise network, MLM or multi-location online stores scenario. 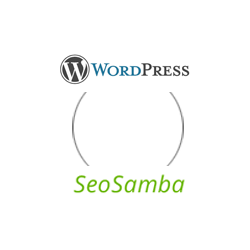 The first and foremost reason why SeoSamba is undoubtedly a better fit in this case is that WordPress Multisite has been built as somewhat of an afterthought, an additional layer on top of the existing WP framework due to popular demand. On the other hand, SeoSamba's very existence is specifically due to the lack of user-friendly and cost-effective multi-sites solutions that would replicate the benefits of franchise marketing. WPMS has been conceived to offer a reasonable way to tie together several existing WordPress platforms, while SeoSamba is a true multi-sites platform from which one can manage an unlimited number of websites. From this sole - yet crucial - difference stems most of the drawbacks of the WordPress MS approach to build a franchise network. By trying to accomodate all types of website projects and businesses, WordPress overlooks many useful and specific features out of the loop, leaving outside developers in charge of providing those functions through highly specialized third party extensions that are sometimes overpriced, and often unsupported in the long run. By contrast, SeoSamba and SeoToaster natively integrate all the features that can actually get online entrepreneurs started on the right foot and straight out-of-the-box, with a software backed by the very team who built it from the ground up over 10 years ago. Needless to say, this pivotal discrepancy is also found in the quality of support you may receive between the generic WordPress and the specialist SeoSamba. For all these reasons, we believe that while WordPress Multisite is a worthwhile solutions for many uses including blog-based content marketing, we can only recommend SeoSamba's software to give franchise and multi-sites online marketers the best out-of-the-box solution for a fast-to-market yet enduring online success. Wordpress too complicated and costly to maintain and scale? HubSpot Software Review Comparative review of HubSpot and SeoSamba. One is proprietary and limited, the alternative is open source and free. Marketing360 Review Thinking about Marketing360 for online marketing? Think again. SeoSamba offers more for your money. 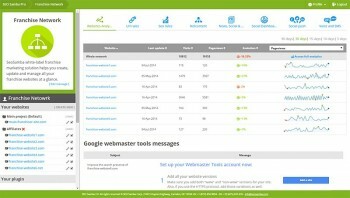 SeoSamba vs Infusionsoft: Which Is Better? Thinking about InfusionSoft for your small business or webstore CRM? Looking to migrate away from InfusionSoft inherent limitations? This detailed must-read head to head comparison article with SeoSamba can save you tons of time, aggravation & money. ElementsLocal (iAPPS) Impressed by ElementsLocal (iAPPS) BridgeLine Digital? SeoSamba gives more power to franchise networks, for a fraction of the price.